(Newser) – The largest foreign intelligence service headquarters on the planet just opened its doors in Berlin, reports the Guardian—just not to the public. 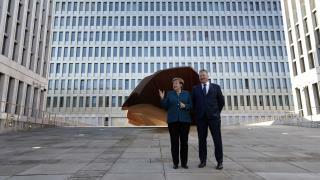 The new home of Germany's Federal Intelligence Service took 12 years to build and cost $1.23 billion. Covering a site where an East German sports stadium once stood, the building has a footprint the size of 36 soccer pitches. About 4,000 intelligence agents are expected to work in the secretive new building, where they will not be allowed mobile phones, private laptops, or access to personal emails or social media. The building, which swallowed up 4.8 million cubic feet of concrete and 20,000 tons of steel in its production, was supposed to open in 2011. It was postponed because of construction issues, and a bit of theft: In 2015, a group of thieves stole taps from toilets all over the massive complex, causing widespread flooding.
" The largest foreign intelligence service headquarters on the planet just opened its doors in Berlin," Oh, oh, this sounds so, so German. Most likely, former East Germans who worked for the communists and the Soviet Union will be employed there, providing access for Russia today. Makes a juicy target when the anti semitic Europeans get out of line once again.